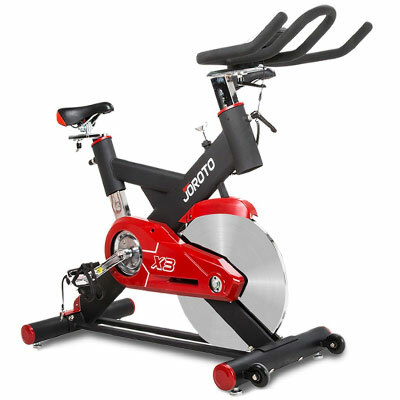 The JOROTO X3 indoor cycling trainer shares many similarities with the Inspire Fitness IC2 or the SOLE Fitness SB700. In other words, it has the same type of frame and flywheel; plus it comes with a fitness meter. However, it costs at least $100s less than the Inspire or SOLE models. It’s not sold as a commercial bike, but features quite a durable frame, which is pretty close to various gym-grade trainers. The JOROTO X3 features a heavy-duty frame rated for a user weight capacity of 280 lbs (127 kg). Most of the frame is made of ovalized steel tubing for improved sturdiness and aesthetics. 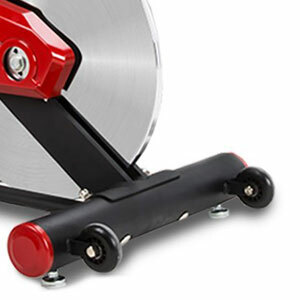 All its joints are precision-welded and highly durable. The two bases are connected by two parallel bars which also add to the unit’s overall durability. Most of the steel parts within the bike’s frame construction are double-coated with a corrosion-resistant and chip-resistant powder finish. The color used is black, with the JOROTO logo painted white/red. The seat and handlebar posts feature a chrome finish. Like most other trainers with this type of frame, the JOROTO X3 doesn’t have a stepping pad. The frame is durable, though, to support workouts that require stepping on its mid-section. However, this type of workouts is not recommended as none of the middle frame bars are horizontal, and do not provide perfect stability for this. Plus, the “v” section of the frame is slightly higher than for other trainers. The bike’s bases are equipped with adjustable, metallic stabilizers. Therefore, you can perfectly level it on any type of floor. Also, the front bar features two large transport wheels which facilitate its relocation. This cycling trainer is considerably heavy in comparison to a road bike, or mountain bike. It weighs approx. 112 lbs (51 kg), but all this weight is a plus as it is reflected within the unit’s overall stability and sturdiness. Also, due to the front wheels, when moving the unit, you won’t have to handle more than half of its total weight. One last aspect to mention here regards the bike’s overall dimensions. With the frame fully assembled, it measures approx. 50.4″L x 20.9″W (128 x 53 cm). It doesn’t take a lot of usage space, so it can fit even into a smaller apartment. However, it’s recommended to leave at least two feet of clearance all around it, for ease of access and safe usage. The JOROTO X3 features a 4-way adjustable seat. Its upright post offers several adjustment positions, while its horizontal slider also allows several inches of front to back travel. This being said, the bike can accommodate users between 5’2″ and 6’4″ (157 – 193 cm). 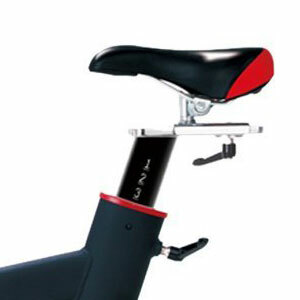 The included saddle features a thick layer of padding, especially at the rear part. It has a longitudinal groove for an improved airflow during training. But on the other hand, it has a standard design, so you can easily find a replacement for it if you would like to use a different type. Also, its standard connection point to the slider gives you the possibility to slightly tilt it forward or backward. The bike’s handlebar features a multi-grip design. It doesn’t have the drop-down grips like the BodyCraft SPR, but does have a long loop aero bar in the middle, which along with the lateral grips, considerably improve your posture options during training. Just as the seat, the bike’s handlebar is 4-way adjustable. It’s fully covered by a layer of rubber foam material in order to deliver an enhanced and comfortable grip. 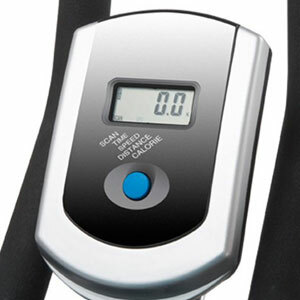 This JOROTO exercise bike features a standard friction resistance system. It consists of a felt pad attached to the tension dial on top of the main bar of the frame. The friction pad is guarded by a plastic cover, but this part can easily be removed to allow access to the pad, for lubrication or replacement if needed. To adjust resistance, you simply have to rotate the tension dial. There aren’t any clicks or tension settings specified on it, so you can basically tighten it until the resistance pad delivers the amount of friction that you feel adequate for your training. As a general idea, you can tighten the pad up to the point where you can barely pedal. 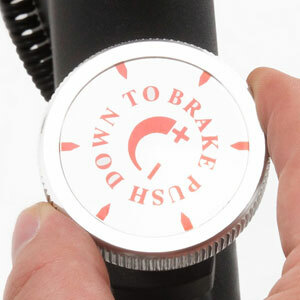 The tension knob also acts as an emergency brake. You can press it all the way down to instantly stop the flywheel if necessary. The main element of the bike’s drive system that we’re going to cover here is the flywheel. 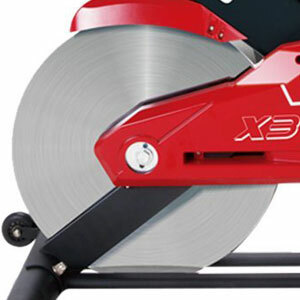 The JOROTO X3 is equipped with a 40 lbs (18 kg) flywheel. Although it’s not perimeter-weighted as for other trainers, such as the Spinner Edge or Schwinn IC3, it still is a balanced flywheel and delivers a pretty consistent inertia. It’s also bi-directional, which means the bike gives you the possibility to pedal in reverse if you want. However, you cannot coast on the bike, as it has a simple drive mechanism, without any derailleurs like road bikes. The bike is equipped with a belt transmission system. It uses a heavy-duty poly-v belt which is covered by an aesthetic shroud. The main pluses of a belt drivetrain are that it doesn’t need any lubrication or periodic maintenance, it delivers a very smooth and quiet motion, and there is less vibration that in the case of a chain drive. The crankset is a heavy-duty piece, featuring solid steel crank arms. It’s designed to support loads up to 280 lbs (127 kg). In other words, as long as you don’t exceed this weight, you can pedal while standing up on the pedals without any problem. The bike’s pedals are also made of a durable metallic alloy. They do not have SPD elements for spin shoes but do have toe clips for extra thrust. They also have standard threads, so you can replace them with SPD pedals if you want. 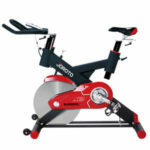 Not all spin bikes come with a fitness meter, so the fact that the JOROTO X3 includes one is quite a plus, even though it’s a basic unit. The meter features a standard LCD display (with no backlight). It can track time, distance, speed, and calories. It doesn’t have a pulse tracking function, so if you need to maintain your heart rate within a specific interval during training, you will have to use a separate device. Also, the speed and distance are displayed only in metric units. The meter unit is very easy to operate. It has only one button which allows you to toggle ON/OFF its SCAN function. The SCAN function rotates all the workout metrics showing each one for several seconds on the display. By toggling OFF the SCAN function, you can select any of the metrics to be shown on the display all the time. The button also covers the unit’s RESET function. You can press and hold it down for a few seconds to clear all the values to zero. The fitness meter is battery powered. It also has a sleep mode to which will enter after several seconds of inactivity on the bike. To power it on, you can either press the button or begin pedaling. The JOROTO X3 exercise bike comes partially assembled. The flywheel, the drive system, and the resistance system are already in their places. You only have to attach the base bars, the pedals, the seat, the handlebars, and the console. This shouldn’t take more than 30 minutes. A basic toolkit for assembly is included and the manual provides very clear assembly instructions. For maintenance, it is recommended to wipe off the perspiration from the frame at the end of your training sessions, and periodically check the unit for loose bolts and parts. The JOROTO X3 is a heavy-duty indoor cycling bike featuring a standard friction resistance system, a bi-directional 40 lbs flywheel, and a weight capacity of 280 lbs. It excels in micro-adjustability and also includes a basic fitness meter, an accessory that many other spin bikes do not include. It’s perfect for medium to intense cardio workouts, interval training, stamina, and leg strength development, and for weight loss. It’s not one of the most affordable bikes, but it’s still a few $100s cheaper than other similar models. In all, it’s a solid exercise bike, offering an excellent value for the price.